Atal Bihari Vajpayee (December 25, 1924 - August 16, 2018) was an Indian politician who thrice served as the Prime Minister of India, first for a term of 13 days in 1996, for a period of eleven months from 1998 to 1999, and then for a full term from 1999 to 2004. India is not a piece of land, but a living entity. As quoted in Agnohotri, V. (2018). Urban Naxals: The making of Buddha in a traffic jam. Also quoted in Kashmir integral part of India, Article 370 should be scrapped: Vijay Rupani Indian Express. I would like this house to join me in paying fulsome tribute to our scientists, engineers and defence personnel whose singular achievements have given us a renewed sense of national pride and self confidence. Extract from Suo Motto statement made in the Parliament, after India’s underground nuclear tests conducted on 11 May 1998. Sujata K. Dass (1 January 2004). 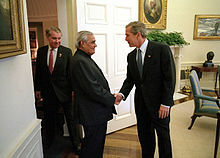 Atal Bihari Vajpayee: Prime Minister of India. Gyan Publishing House. ISBN 978-81-7835-277-0. We, the Indians, as Guru of the Nations: yes, I believe in that. We can be—or once more become— the hope of mankind. But that requires efforts and courage to be ourselves culturally. Unfortunately, we live in an age of political dwarfs, political managers without vision or courage. But their time is running out. I have a vision of India: an India free of hunger and fear, an India free of illiteracy and want. I dream of an India that is prosperous, strong and caring. An India, that regains a place of honour in the comity of great nations. This terrible tragedy has created the opportunity to fashion a determined global response to terrorism in all its forms and manifestations, wherever it exists and under whatever name. I assured President Bush of India's complete support in this. After his meeting with George W. Bush in Washington in 2001A World United. The White House. Retrieved on 5 December 2013. Russia and India both have a geopolitical interest in a peaceful and stable Asia, which would be relieved of outward pressure and would not harbour and suffer from extremists.... Russia and India must do their best so that international community's efforts in Afghanistan were not futile. Before signing of declaration on global challenges and threats to international security and stability with Russia's president Vladimir Putin quoted in "Putin, Vajpayee to sign declaration on global challenges". Pravda. 12 November 2003. Our aim may be as high as the endless sky, but we should have a resolve in our minds to walk ahead, hand-in-hand for victory will be ours. In our search for a lasting solution to the Kashmir problem, both in its external and internal dimensions, we shall not traverse solely on the beaten track of the past. Mindsets will have to be altered and historical baggage jettisoned. English translation:I am not afraid of defeat and victory, whatever comes my way of duty, I will accept it, because this is true and that is true. Quoted from "The truth according to Vajpayee". The Telegraph. 24 November 2009. Politics is a game of compromise. "Quote of the week". India Today. Retrieved on 5 December 2013. Secularists like you don’t have to spend sleepless nights over this. I will carry the secular baggage on my broad shoulders. His poem quoted in "The truth according to Vajpayee". Shri Atal Bihari Vajpayee. Ataljee organization. Retrieved on 5 December 2013. With the banner of Nationalism in our hearts to build up a Mighty India, let us march forward on the path of Duty. This is no time for rest; this is no occasion for faltering. Let us go onwards and onwards, till we reach the Goal. Our National life is full of diversities. We have here a variety of languages, of faiths, of communities, of modes of living, and schools and styles of literature and art. This diversity reflects the abundance of our national life, and need to be preserved and promoted. They who interpret secularism as dharma-nirpekshata fail to understand either dharma or secularism. A secular state does not mean an anti-religious state, nor even an irreligious state. For, in that sense, the people of India just never can become secular. A secular state simply means a state which does not identify itself with any specific mode of worship and holds the balance even between all sects- secularism thus mean sampradayanirpekshata and not dharma-nirpekshata. The question is not of ‘right’ and ‘left’; the issue really is Democracy versus Totalitarianism. The choice is not between ‘progressivism’ and ‘reaction’; the people have to choose between forces uncompromisingly pledged in their loyalty to the nation with extra-territorial loyalties. Differences are bound to remain in the country, but the Indian nation cannot afford to be divided in its basic commitment to Nationalism and Democracy. A Sense of oneness, a sense of indianess requires to be created among our youth to halt the mad rush towards an imported five star video culture. We believe that through dedication and perseverance we will realize national unity and create a new India of our dreams. In Delhi, I gave you a slogan: ”Unite and win, today we are achieving unity, tomorrow we will achieve victory", Vandematram. The enemy is within our very hearts and minds. It is the cancer of doubts and despair which is overtaking our people. It is the loss of faith in our system, in the very future of our beloved motherland. This creeping rot must end. I am sure that very soon, by the grace of god and the inherent good sense of the Indian people, it will end. But that calls for a great national effort. We are committed to bridge the gap between the city and the village. We are committed to bridge the gap between capital and the labour. We are committed to bridge the gap between the citizen and the administration. We are committed to bridge the gap between the centre and the states. We are committed to bridge the gap between Linguistic, religious and caste groups. All democracies, especially in developing countries that have considerable diversities and carry the burden of developmental imbalances, have had to grapple with one paramount challenge and that is : how to harmonies’ the legitimate self – assertion of communities that suffered deprivation and dis-empowerment in the past with imperatives of good governance. My poetry is a declaration of war, not an exordium to defeat. It is not the defeated soldier's drumbeat of despair, but the fighting warrior's will to win. It is not the de-spirited voice of dejection but the stirring shout of victory. We are nations forged from many traditions and faiths, proving year after year that diversity is our strength. From vastly different origins and experiences, we have come to the same conclusions: that freedom and democracy are the strongest bases for both peace and prosperity, and that they are universal aspirations, constrained neither by culture nor levels of economic development. [He] is a Nehruvian in drag. Today, to put down Modi, Congressmen don’t tire of praising Atal Bihari Vajpayee as a moderate consensus builder. But while Vajpayee was prime minister he was targeted with as much ruthlessness as Modi—only that it cut less ice with the media or the people at large because Vajpayee was a well known national figure. By contrast, Modi was a relatively obscure regional leader for most Indians, as well as for most media professionals. He is a young leader of opposition. Who is always criticizing me. But I see in him a great future. Mr Vajpaee, I have not met you before. But I have no hesitation to saying that Pakistan’s relations with India have never been as warm and cardial as they were when you were your country’s Foreign Minister. Nawaz Shareef quoted in Sanjay Kaushik (1 January 1998). A. B. Vajpayee: An Eloquent Speaker and a Visionary Parliamentarian. APH Publishing. ISBN 978-81-7024-976-4. I believe he has a sense of integrity...Relatively speaking he has a cleaner record than most politicians in office. He was a person who could bring out the best in others. There are some leaders who bring out the worst in others. He brought out the best. It was the Congress leaders who instigated mobs in 1984 and got more than 3000 people killed. I must give due credit to RSS and the BJP for showing courage and protecting helpless Sikhs during those difficult days. No less a person than Atal Bihari Vajpayee himself intervened at a couple of places to help poor taxi drivers. Vajpayee is as wishy-washy as Nehru was. I don't think he has any ideology. This, my friends, is the Jaziya that non-Muslims pay in "free" India, one governed by Prime Minister Atal Bihari Hajpayee.